Continuing efforts on the Vlaskin Office, I made a retro computer for the tellers behind the counter. I currently have the screen as a separate texture with some animated emissive masks tiling over it to give it the appearance of worn, used tech. Once I figure out how to render out a gif, I'll have a quick showing of it in motion. As for references, I borrowed heavily from the Apple II and Apple Lisa computers. Those type of designs on the computer case with shapes that flow from computer to keyboard really hit home for me. Project wise, I'm starting to organize the assets through Trello. This way I can lay out all the assets that need to be made as to keep an eye on the bigger picture (something I occasionally struggle with). This is my first time using Trello on a personal project, so I'm testing out a few ways as how to organize my project. It is currently a private project board, but if people express interest at looking into my workflow, I'll consider opening it up. The next asset that I'll be working on is wooden paneling around the outer walls of the office. These will get a taste of Zbrush so I can brush up on that software. Looking forward to sharing the next update! Now that I'm starting to budget some free time for myself, I feel like I need to revive the blog and start sharing progress of a new environment. It's still in its early stages (mostly block out). I'm dubbing this the Vlaskin Office. It's a bank of sorts for a small, nearly deserted town set in the near future. This building serves as the bank/city hall/official building for the town it resides in. I'm planning on creating the interior of the building along with the small exterior landscape and vegetation. Most of the technology will lean heavily in the style of retro scifi. I've always been a fan of older looking equipment in more advanced cultures/societies. 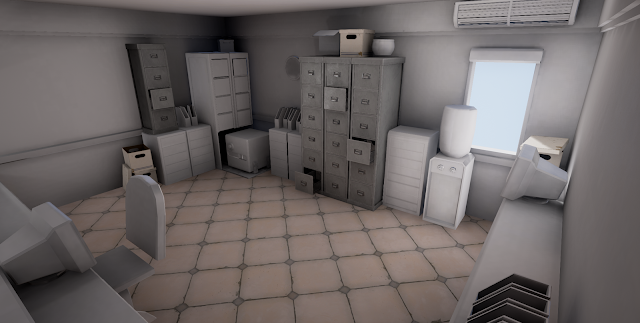 My goals for this project include creating a story using the assets, make the environment feel alive and lived in, and create a few key shots that include custom animation (such as the safe that will be unveiled from the fake bottom of a filing cabinet). I look forward to updating the blog with progress as it's complete. I do not have a set time established, but want to budget at least several hours a week for focusing on this environment. I also hope to share tips/advice when building an environment/assets for Unreal Engine. Thanks for looking! This was a pretty quick texture that I created for the lower half of a building that will be in my scene. 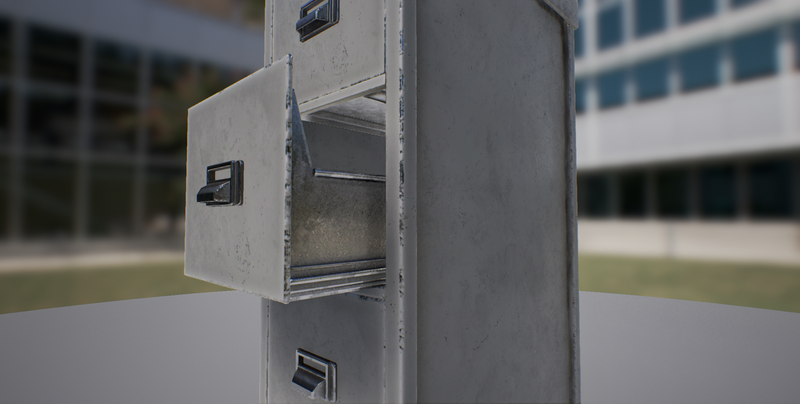 It looks great in Unreal Engine, but I always feel that I can push my textures farther. Still I'm happy it only took a few hours to get the look and feel I wanted. 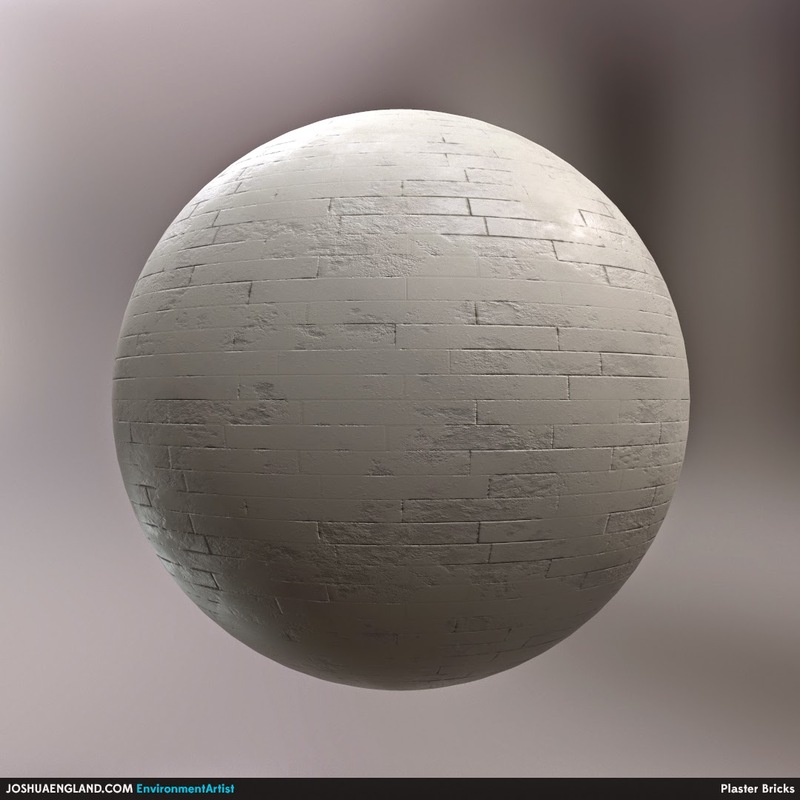 I created a pretty flat brick texture that has been plastered over and painted several times. At first glance, I wanted it to appear just as normal plaster, but upon further inspection, the bricks would begin to take shape. After my street vignette is completed, I may go back and polish a few of these materials. I can always add more color variation and a hint of more detail in the plaster portion.